If you search the internet for the best ways to stop mold (or mould) you'll find plenty of advice. Unfortunately, a lot of it seems to have been written by well intentioned people with little, and probably no experience of dealing with damp and mold in the real world. Here are some of the common ones - they seem to make good sense, but in reality will make little or no difference. For each one I've given them a condensation cured rating. Surely this is good advice ? It comes from the NHS web site (and others) after all. If you have mold in the kitchen then it's not a bad idea. In reality most homes with mold have the problem elsewhere so trying to trap condensation with pan lids will make little difference. "We always open our windows in the morning"
Again this sounds like good advice (from the NHS and others) but in reality it will make no meaningful difference. Customers with condensation and mold often tell us that this is what they do. But short term fixes like this never work. Also it breaks our 'Golden rules' see below. A home needs gentle air movement all the time - not a quick blast in the morning. And depending on the time of year it can let cold draughty air in (and also unwanted visitors). It is far, far better to try and ventilate bedrooms over-night (e.g. using vents in windows, and leaving the door ajar) since this is when the condensation 'damage' is done. With people in bedrooms humidity levels rise just when the temperature falls - perfect conditions for creating condensation which allows mold to form. So opening windows the following morning is too little too late. Another one from the NHS. We hear this a lot, and it is good advice - in the warmer spring / summer months. But this is the time of year when condensation and mould growth are rarely a problem. Over the cooler winter months it is not realistic to expect tenants for example to hang washing outside.So although this seems sensible advice, it's not really practicable. Another piece of advice that sounds very sensible. 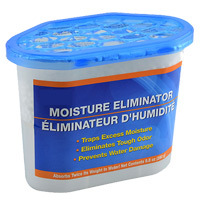 Dehumidifiers capture water from the air and will cure mold won't they ? You can read our page on why we think dehumidifiers aren't a cure for condensation and mould. A large proportion of the homes we see already have one or more dehumidifiers humming away in the background, and they still have a mold problem. "mould is almost always caused by condensation"
A somewhat pointless and misleading piece of advice. Why ? because common sense would suggest that if you have so called 'penetrating' dampness (a leak causing water to come in from outside) then it should be repaired. But penetrating dampness will cause only a very localised problem. Mould is almost always caused by condensation, so fixing that leaking gutter will not cure mould in the bedroom wardrobe. Anti-mould or anti-fungal paint will be more effective at holding back mold in problem areas like bathrooms. But any mold indicates that your home has a ventilation problem. So treating mold with anti-mold paint is a bit like treating a cold with a handkerchief. Although it will hold back the mold better than normal paint, ultimately the mold usually wins. 7. Use moisture traps and position them under windows to attract moisture before it forms on the glass. Make sure you let a small but consistent amount of air into your home (If it's draughty or cold then you've overdone it). Allow air to circulate freely around your home. This means leaving doors open or ajar so make sure you have fire alarms that work. 'Wet' rooms, like bathrooms, need effective ventilation. A good extract fan with a window trickle vent will be a good combination. And train the family to open the window when they're having a shower ! Make sure your home is adequately heated. See our tips on what we think you can do to reduce condensation in your home. And if that doesn't work, you can see our solutions to get rid of condensation and mould. Finally you can use our damp home diagnoser tool to help you understand the cause of condensation and dampness in your home.